This Kreature is the meta-form of Medithorn. Since the huge horns on top of its head would give away its position anyway, it no longer bothers with subterranean sneak attacks. Instead, it favours a full-frontal assault. The flower on its head emits ultrasonic waves that will disorient its opponent as it bombs them with massive cholla balls. If an opponent manages to close the distance, Megathorn will seize them and crush them against its trunk. 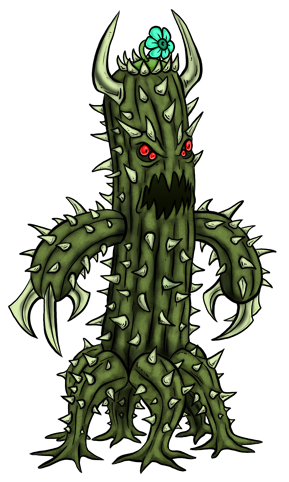 Its thorns contain an anti-coagulant, so the blood from its pulverized victims will flow freely, providing sustenance not only for itself but also for its brood of Minithorns and Medithorns. An impressive cactus monster Megathorn is no doubt. I love that the dainty flower can now create ultrasonic waves.